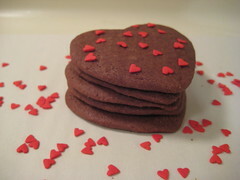 For the past couple of years, I’ve used this sugar cookie recipe to make Valentine’s Day cookies. This year, I wanted to make some for the chocolate lovers too. I found this recipe on Epicurious and heeded the warnings in the reviews regarding the dough so I was ready for a battle. And what a battle it was! I took the dough out of the fridge and after 30 minutes it was still rock hard. I let it sit for about 30 minutes more and then it was at least slightly pliable. I had to work it with my hands to get it close to roll-able, and even then I had to roll it out between two sheets of plastic wrap so it wouldn’t stick to the rolling pin. The flavor is not intensely chocolaty, but it definitely satisfies. And I rolled the dough thin enough so the cookies have a nice exterior crunch. Flavor wise, these are good. But I’m not sure if the flavor outweighs the pain they were to roll out. We’ll see what my guinea pigs say when I bring them into work tomorrow. I’ve made these a couple of times as an alternative to plain sugar cookies. They’re easy enough, but I thought they were only so-so taste-wise. One of the sections of dough, I rolled into a log and rolled in coarse sugar, and then sliced and baked. I liked the crunch the sugar added, and they were super easy as slice-and-bake (didn’t have to fight to roll them out). Jami, that sounds like a better plan…much easier to shape that way. Thanks! mmm, those look awesome! i have made this type of “log” cookies with chocolate and pistachios…so good! Wonderful! I love these types of cookies. They truly are the perfect base for almost any type of add on. Cute cookies! Perfect for the day of love! These look so yummy- I need some valentines treat in my house! Thank you for this awesome posting! I was just looking for some chocolate sugar cookies so that I could mail them out for Valentine’s Day, and lo and behold, you just posted about them! They look great; can’t wait to sneak one before I stick them in the care package! Oh Dear– You are my hero. So, how did your co-workers like them? Those look really tasty, but reading about your battle with this dough makes me wonder if it is worth the effort? If you like deeply chocolaty cookies try Nigella Lawson’s Triple Chocolate, Chocolate Chip Cookies from Express. They are sinful, rich, and always popular with chocolate lovers.